Luc Orient, his mentor Professor Hugo Kala of superlab Eurocristal, and his girl-friend Lora, rescue aliens from the planet Terango, stranded on Earth (episodes 1-2). They then travel to Terango to thwart the evil tyrant Sectan who plots to invade Earth (episodes 3-5). Subsequent adventures involve a series of scientific mysteries. Luc and Lora acquire super-powers in episode 6. The heroes eventually return to a much-changed Terango in episodes 13-16. Their arch-enemy is the evil scientist Julius Argos. Luc Orient was originally serialized in the weekly comic magazine "Tintin" starting in 1966. It was one of the many series simultaneously launched by its then-editor Greg to give the magazine a needed facelift. 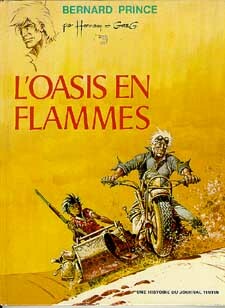 Luc Orient's adventures were then collected as a series of graphic novels by Editions du Lombard, starting in 1969. The series continued regularly with one or two volumes per year until episode 13 released in 1978. After "Tintin" cancellation in 1978 (following several name changes), the later episodes were released sporadically. Episode 16 was written by Paape himself. "Episode 17" was not a single new story but a collection of short stories previously published in the digest-sized "Tintin Pocket" in the early 1970s and reformatted for graphic novel publication. Episode 18, released in 1994, seems to be the last in the series. Luc Orient is now being reprinted in omnibus editions, two volumes in one. Eddy Paape (1920- ) is a prolific Belgian artist who joined the editorial team of "Spirou" in 1946, first temporarily taking over the Jean Valhardi adventure series from fellow artist Jijé. In 1958, he and writer Jean-Michel Charlier created their own globe-trotting adventure hero, Marc Dacier. In 1965, Paape moved to "Tintin" where he and Greg created the Flash Gordon-inspired popular science fiction series, Luc Orient. More recent genre series include Udolfo and Carol Détective with writer Andre-Paul Duchateau, and Les Jardins de la Peur [The Gardens of Fear] with writer Dufaux. One of the most prolific creators in comics, Greg (Michel Regnier) (1931-1999) started his career as a writer/artist at age 16 with the humor series Nestor & Boniface. 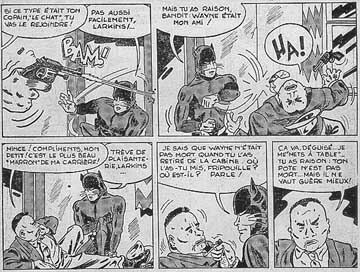 In the early 1950s, he produced a superhero series, Le Chat [The Cat], under the pseudonym of "Michel Denys". In 1954, he launched his own, short-lived magazine, "Paddy". In 1958, Greg joined the editorial team of "Tintin," which he later edited from 1965 to 1975. There, he wrote and drew a number of humor adventure series including Rock Derby, Zig & Puce (taken over from Alain Saint-Ogan) and the classic Le Mystère de l'Homme Aux Trèfles [The Mystery of the Clover Man]. As a writer, he contributed scripts to Chick Bill, Modeste & Pompon, and Clifton and co-created a number of cutting-edge, modern adventure heroes, such as Bernard Prince and Comanche for artist Hermann, Bruno Brazil for artist William Vance, and Luc Orient for artist Eddy Paape. He also wrote the poetic series Olivier Rameau for artist Dany. During the 1960s, Greg also wrote and drew the hugely successful humor series Achille Talon (known in the U.S. as Walter Melon), created in 1963 for "Pilote" and the juvenile adventure series Les As for "Vaillant." Greg also wrote some of Spirou's best adventures, and after artist Andre Franquin's death, took over the writing of the spin-off series, Le Marsupilami. Other writing credits include Cobalt and Johnny Congo. In total Greg's comics career total over 250 graphic novels. Greg also penned several successful detective novels for publisher Fleuve Noir and the film adaptations of two of Tintin's animated features: The Temple of the Sun and The Lake of Sharks. Greg passed away on 29 October 1999. Luc Orient © 2001 Greg/Eddy Paape/Lombard. All rights reserved. Under the pseudonym of "Michel Denys", Greg wrote and drew the adventures of Jacques Bertrand, reporter of the daily London Planet, who fights crime as -- THE CAT. His main foe is the mysterious crime syndicate boss "Number 1". 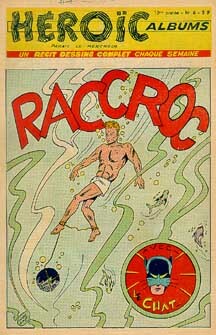 26 episodes were serialized in the magazine "Heroic Albums" in 1953.